Guru is known as Brihaspati (Sanskrit, “lord of prayer or devotion”) , Deva-guru (Guru of the Gods). Guru is a benefice planet and considered to be the most auspicious, helpful, generous and beneficent of the planets. Worship of Jupiter results in progeny, good education, valour, longevity of life and recovery from physical illness. In the Zodiac. He is the Lord of Dhanus and Meena. Guru stays for one year in each Rasi, taking 12 years to complete the cycle. Brhaspati (often written as Brihaspati or Bruhaspati) also known as Brahmanaspati and Deva-guru (guru of the gods), is the name of a Vedic deity. He is considered the personification of piety and religion, and the chief ‘offerer of prayers and sacrifices to the gods’ (Sanskrit: Purohita), with whom he intercedes on behalf of humankind. 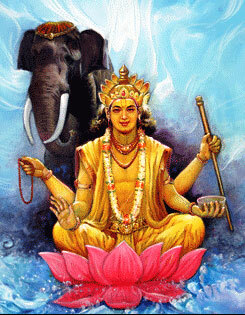 Brihaspati is also known as Deva-guru (guru of the gods). Jupiter is a good indicator of fortune, wealth, fame, luck, devotion, wisdom, compassion, spirituality, religion and morality among other things. Jupiter rules stomach and liver. Jupiter or Brihaspathi rules over the sidereal signs of Sagittarius and Pisces. Jupiter is a benefic planet and considered to be the most auspicious, helpful and generous among all Planets. He is the teacher of Gods and knows the Vedas and is an expert in all forms of knowledge. Brihaspathi is four armed and wears yellow cloths and is very fond of sweets. He sits on a lotus and his chariot is pulled by eight yellow horses. Brihaspati is the name of the ruling deity of Jupiter planet. Also called as Guru, Brihaspati is preceptor for all the gods. 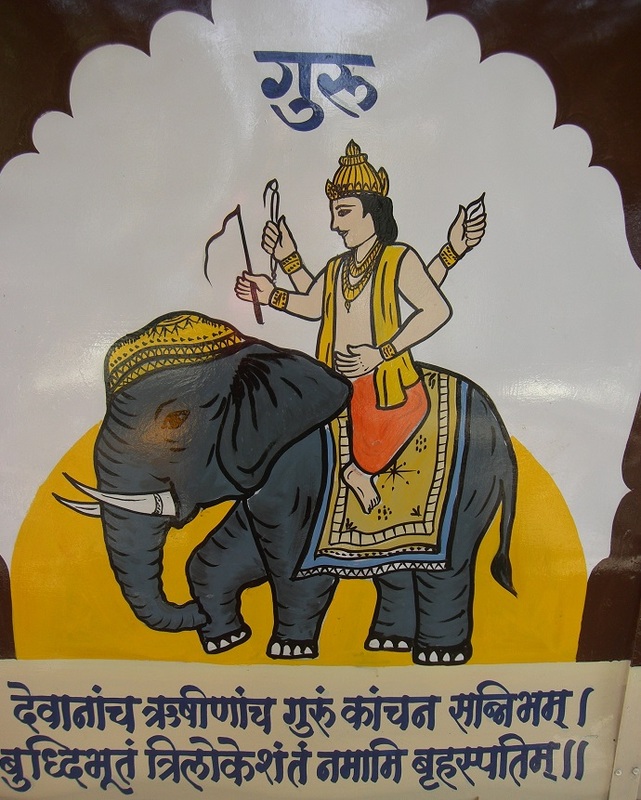 He rides on Ayiravat, the white elephant with four tusks. Astronomically, Jupiter is the largest planet in the solar system and therefore duly finds its exalted position in astrology too. He bestows vidya (wisdom) which is essential to understand any subject in depth. He is revered as the teacher of all Gods. He is the dispenser of divine justice. No other planet hates Jupiter as he himself is Providence. He gives good manners, patience and devotion. Many of the problems in life are successfully combated if Jupiter is strong in the chart. As the Guru of the Gods, he teaches the religion, philosophy and morals of cohesion and unity. Brihaspati is the preceptor of God made law and man made law. The Gods seek council from him when forces of division usurp their domain. He is also a family man who bestows blessings of wealth and fecundity to those who are loved by him. Of all the planets, Jupiter is considered to be the most benefic and gentile. Japa of the Guru beeja mantra: ” Om jhram jhreem jroum sah gurave namah “, 16000 times in 40 days. Recite the Guru stotra: Devanam cha rishinam cha Gurum kaanchan Sannibhaam Buddhi bhutam Trilokesham tam namaami Brihaspatim. Donate: Saffron or turmeric on thursday. Wear a 5 mukhi rudraksha.